Subtle movies get a lot of praise from people like me. To make a very sweeping (and perhaps unfair) generalization, if you want to make sure your movie gets the highest grades, you’d better avoid anything that resembles to traditional storytelling, make it as hard as possible to penetrate and leave it open for all sorts of interpretations. Subtlety is good. Subtlety is fine. But do you know what? Sometimes I feel that I can’t take anymore. It chokes me. It drains the fun out of the movie going experience. I’m craving for something that will give me a bit of entertainment and escape for a couple of hours. Sometimes I don’t want a movie that requires me to watch it several times or read essays about it just to get a reasonable appreciation and understanding of it. I just want something I can grasp instantly without for that sake being dumb, stereotypical and pointless. I must have been in exactly that spot when I watched Moneyball last week. My expectations were moderate. I had been vaguely interested in seeing it for a while, more because I wanted to catch up with the talked-about-movies from 2011 than because I really thought I would have any interest in it. After all it was a movie about baseball, a sport I know nothing about and have no interest in whatsoever. Since it’s about hitting balls with a bat, returning the ball as quickly as possible and running between bases, it resembles to the Swedish game “brännboll”, a game that was designed to humiliate people like me. I could never hit the ball as we played it at school, not even if I used the alternative flat “girl” bat, which looked like a board. After the mandatory three tried I had to admit my defeat and walk to the first base with my head hanging in shame. An entire movie that takes place in sport grounds, locker rooms and meeting rooms for sport clubs, a movie that circles around a sport manager who decided to use a data based system to choose which players to acquire for his team, a film that is centred around a bat-and-ball game, could that really work for me. Yes, the movie is quite traditionally crafted. I could predict exactly what curve the protagonist would lead, how long his problems would last, when the curve would start to turn up, how long that phase would last and how he then would get a new bump in the road and how the curve would end. I could have drawn it on a paper before start and it would have matched that exactly when we came to an end. But just because you know how a story will lead, it doesn’t mean that you can’t enjoy the ride. I know exactly how Vivaldi’s Four Season’s runs and I still enjoy listening to different versions of it. A reviewer at IMDb called Moneyball a “high quality crowd pleaser” and I think he’s right. There’s quality everywhere – in the direction, in the cinematography, in the script and in the acting. Brad Pitt as the manager and Jonah Hill as his geeky assistant are both solid. The label “crowd pleaser” bugs me a little. I was pleased, yes, but who wants to be one in the “crowd”? Not me. But the fact remains: With many other moviegoers, I totally loved Moneyball. Sometimes I need a break from subtlety. This movie it came for me in the time when I most needed it and I devoured it and I left the theatre happy “just-seen-an-enjoyable-movie” smile on my face. I was on a high. It was as if I had a well needed reset of my system, cleansing it from subtleness bordering to complete boredom. And now I’m ready for what 2012 will bring to me. A lot of subtlety, I guess, but hopefully also a few good crowd pleasers to just enjoy. I’m a huge baseball fan. I watch maybe 100 games a season. I’ve even been to a “fantasy camp” with a professional team in which we form teams coached by real and well known players. One of the most interesting aspects of that experience was the clubhouse scene. We had team meetings, lots of funny rules of behavior designed to make fun of anyone and everyone, a kangaroo court to address infractions and impose fines. It was obvious from how much the players enjoyed it that it was fairly authentic. So, Moneyball should be amazing to me, right? Not so much. I enjoyed Invictus, though I know zip about rugby, much more. I find that I enjoy movies more the less I know about the topic or the setting. Knowing too much can make a movie lose a dimension of richness. I spend too much attention trying to overlook little details that seem awkward or out of place. It’s like watching that movie filmed on location at your college campus. The characters are supposed to be walking toward the football stadium, but you can tell they’re walking in the opposite direction. I’m glad you enjoyed it. Brad Pitt pretty much makes any movie at least enjoyable. And baseball…I could go on all day and often do. If you ever have the chance to go to a professional ballpark in the US, go for it. Especially one of the newer parks like where the Giants play in San Francisco. It’s an experience. Baseball knowledge not required. Wow, you’re really a fan! That fantasy camp must have been amazing. I really enjoyed this movie, even if I don’t know anything about baseball. As a programmer I quite like the idea that you can program a machine to create a winning team. Heck, if only we could program computers to solve everything. I’m not a programmer, but yes, there’s something attractive about the idea of being able to predict the seemingly unpredictable. Makes me think of Hari Seldon’s invented science in the Foundation series. Another criticially acclaimed film from 2011 that I have not seen… and another one that I need to! 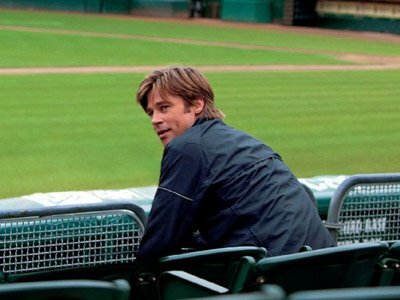 I am soon to make a 2011 film marathon list and Moneyball is one of the first coming! Thanks Matt! I hope you’ll enjoy it as much as I did. It’s not innovative by any means, but it’s a safe card for a couple of hours of good, well crafted movie entertainment. It may not feel quite like the classic baseball movie others have achieved, but it’s certainly pleasant enough to be enjoyable even by non-sports fan, and features great performances from Hill and Pitt. Good review Jessica.